When I first got my digital camera I knew zippo about the importance of resolution and what the real difference between the ‘good’ quality setting and the ‘best’ quality setting was, other than that I got more photos in the camera memory if I kept it on ‘good’ rather than ‘best’. And when I uploaded the photos on the computer they were at 72dpi but they were 18″ wide. That’s way too big , I thought. So I resized them to something more sensible, BUT not understanding the mysteries of dpi, I left the resolution at 72 dpi. Then, compounding my ignorance, I saved over the top of the original file. Is this starting to sound familiar to any of you? Then I got into digital scrapbooking and I found that 300 dpi was the ‘standard’ for scrapbooking. And when I dragged these photos onto my digi layouts, my software (PSE) automatically converted them to the resolution of the layout file (300 dpi) and they were the size of postage stamps. And if I just dragged the photos with my cursor to make them larger the quality degraded enormously. Aaarrrghh!!!! So what to do? Well if you have shared this experience, or if you need to upsize your images and don’t have any prints that you can scan at a high resolution, this technique might be of assistance to you..
A digital image is composed of pixels (tiny cells filled with colour). The more cells per inch (known as dots per inch or pixels per inch), the better the quality. When you take a digi photo, most cameras produce their images at 72 dpi. They deal with the quality issue by increasing the size of the image. The idea is that when you upload your photo into your editing software you can increase the dpi and decrease the image size accordingly without changing the number of cells that the picture is made up of. (I hope this is making sense). A bit like pouring water from a wide shallow bowl into a tall jug. Same amount of water but smaller surface area whilst having greater depth. Now if you try to increase the size of the image by stretching it, you still have the same amount of pixels to work with so you get gaps between the pixels. Your photo editing software will try to fill those gaps by taking its best guess at what colours should go into them. So it’s logical that you’ll get a better result if the gaps are small and your software doesn’t have to guess too hard. Now hold that thought whilst I outline the following technique to incrementally increase the size of your images. I use PSE4 but the principles hold true whatever the software and it shouldn’t be too hard to translate the control directions into your software of choice. 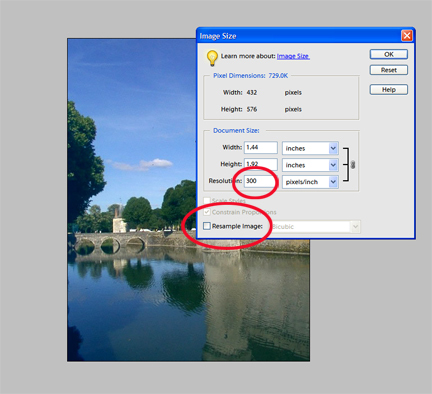 Step 1: Open the Image Size dialog box (Image>Resize>Image Size) uncheck the ‘Resample Image’ box (bottom left in PSE4) and change the resolution to 300 dpi. Click on OK to exit the dialog box. 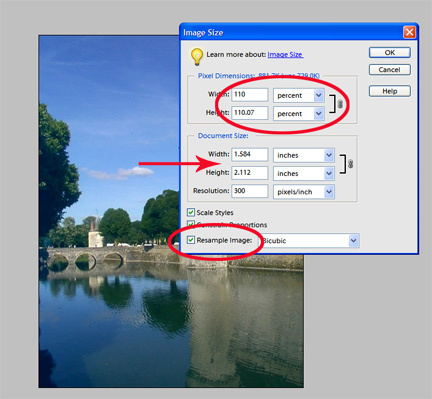 Step 2: Go back into the Image Size dialog box and re-check the Resample Image box. Note how the width and height are a lot smaller than your original image. At the top of the dialog box are the fields which tell you how many pixels your image is sized at. Click on the down arrow at the right of the field and select ‘percent’ instead of ‘pixel’. In the width and height fields type 110 over the 100 that currently exists. Click on OK. Your image will increase in size by 10%. Repeat Step 2 as often as needed until your photo is at a more usable size. You will notice that each time you do this the height and width of the image are increasing. This method is slow and painstaking but it helps to minimise quality degradation. You’ll note I said ‘minimise’ quality degradation, not prevent it. There will always be quality degradation when you’re trying to create pixels where there were none before. But this incremental approach enables you to gradually build the image from a tighter pixel base rather than having your software take a wild stab at filling in large gaps between pixels. Obviously you can’t keep doing this indefinitely. You will find a cut off point where you start to see a level of reduced quality in your photo that you won’t want to accept. That’s your signal to stop and accept that that’s the largest this photo is going to get. Then all you need to do is adjust the lighting and sharpen the image (my post on using the Photomerge function includes a handy scrapbooking technique for doing this) and it’s ready to drag into your layout. the best thing about scrapping is learning new things!! EXCELLENT tips!!!! This is exactly the info I need to work on some pics that were emailed to me. Thank you! oh i remember when i first learned that…. Thank you for taking the time to give us this useful tips! Thanks for the tip. I’ve always wondered how to do this.